← Parting Shot: Got Melk? 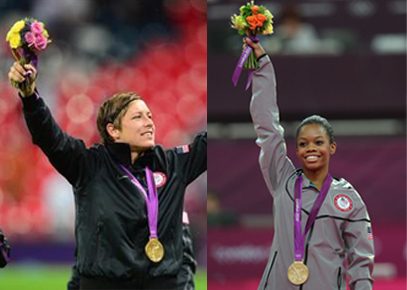 It’s not hard to understand how the United States women rose to such prominence in the global sports arena. With the enactment of Title IX women’s sports have, for the most part, been treated with equal focus and passion, and the American teenage girl has embraced the opportunities available to her. No longer are cheerleading and twirling the only options, not for a long time, and while their accomplishments may not be held as in high esteem as their more masculine counterparts, there’s no denying the footprint and impact of female sports in high schools and colleges today. Frankly, for both boys and girls, there are just more opportunities to participate in sports in the US than in other countries. And then consider the breadth of the pool that US Olympic teams get to pull from – by the virtue of the size of the country – we should be fielding competitive teams in most sports. Just by the simple fact of the numbers. But not only have the women caught up and equalled the feats accomplished by men in some of the biggest sports – basketball, beach volleyball, swimming – they’ve also far surpassed the men in other disciplines, most notably gymnastics and soccer, two sports in which we once again won gold this year and can be considered legitimate powerhouses. And it’s in these two sports, which are on opposite ends of the spectrum, where we can identify two types of female athletes, two archetypes to which little girls across the country can aspire. Abby & Gabby. Our real question here is: to all those little eight-year-old girls out there (loyal readers), whom would you rather be? Abby Wambach or Gabby Douglas? Both are multiple gold medal winners who led their teams to victory, and both are media darlings. But that’s basically where the similarities end. Whereas Wambach participates in a gritty, brutal sport, Douglas’s discipline traffics in glamour and beauty. Abby positions herself at the front of the goal, where she’s liable to be punched, kicked, elbowed and stomped upon; Gabby’s most pugilistic foe is the balance beam. Wambach’s sweaty, short bob is held back by a thin headband; Douglas’s long, lustrous hair is pulled back violin-string tight, almost lacquered into place. Whereas Abby is likely to be covered in grime, Gabby is just as likely to be covered in glitter. Wambach has two looks: home and away; while Douglas seemed to unveil a new outfit for every apparatus. But the comparisons are more than sartorial and superficial. Although Douglas helped the USA teens women win a team gold medal prior to her winning the All-Around gold, gymnastics really isn’t a team sport. The team medals are really an accumulation of individual performances. So while you can validly argue that Douglas led her team to gold, buoying the squad with her standout individual effort, it’s difficult to maintain that there’s any kind of teamwork in the sport (especially considering how Jordyn Wieber, 5th overall after the prelims, failed to qualify for the All-Around final because Douglas and fellow American Aly Raisman finished ahead of her, rules stipulating that only two representatives from a single country can advance to the All-Around finals. It’s really a fascinating catch-22 where they must root for their teammates, but – if they have eyes on the all-around final -only to a certain degree). Wambach, however, plays one of the most team-oriented sports. In fact, she’s the backbone of the USA Women’s National Team, the leader on and off the field, the player that the others look up to, both figuratively and quite literally. And although she’s achieved almost unparalleled individual success (tied for second most goals all-time in international play), soccer is a sport that emphasizes the group dynamic, with eleven players working in concert for ninety-plus minutes to score maybe two goals, three if they’re really lucky. And very few goals are scored by remarkable individual efforts (with exceptions, like Carli Lloyd’s second goal in the Olympic final); most build off a great pass or a hard shot or relentless pressure. And many goals, especially in Wambach’s case, are the result of utter fearlessness, dirty work, and, sometimes, disregard for one’s body. And luck. Lots of luck. Luck can save you in soccer. Not so sure it can do the same on the balance beam. And beyond the nuances of the individual sports and their respective techniques, there’s the greater worlds of soccer and gymnastics to be considered. At thirty-two Wambach is considered an elder-stateswoman, certainly on the back-end of her career. A campaign for a third gold in Rio is definitely a question mark. However, the same can be said for Douglas, who will be twenty in 2016, which is the same age at which Beijing gold medalist Shawn Johnson retired. Competing at twenty-years-old in gymnastics is certainly not unheard of, not defying nature, but – like Wambach – by that time Douglas will likely be past her prime, at an age when soccer players are still on their way up. There’s also the socialization (or lack of it) that these disparate sports engender. For many of the teenage girls competing in gymnastics, the sport and individual success has been the overarching focus of their lives. Training, practice, competitions, travel, this is the lifestyle that they know, a childhood that is very far from the norm, and an environment that puts immeasurable, supernova intense pressure on the albeit sculpted-but-still-very-fragile shoulders of these young girls. We contemplate if they’re able to have many friends outside of their teammates/competitors, and it only takes one look at Mckayla Maroney after her shocking loss (AKA winning the silver) in the vault finals to wonder if these girls are thrust into too much, too soon, if they’re truly mature enough to understand, process and cope with defeat. It’s not absurd to question whether we, as a country that every four years makes the Olympic gymnastics finals Must-See TV, foist too much pressure and expectations onto these teenagers who should be worrying about getting a date for Junior Prom, not about perfectly executing 2 1/2 twists with a blind landing to secure the gold, or, God forbid, how to react if they don’t win gold. Then again, watching Gabby Douglas speak after winning gold, we can’t help but also wonder if they’re mature enough to handle victory. Or if they’re, in fact, too mature, too polished, the way they speak as if they’re still in the midst of their floor performance, projecting their high-pitched, helium-infused voices, exaggerating every expression, stretching their already wide smiles, and nary ever taking a breath. It’s as if their coaches can teach them to defy gravity, but they can’t teach them to pause between sentences. At this point, if you’ve read this far, it seems like we’re advocating for the Abby Wambach-template, arguing for soccer over gymnastics as a sport (and career) of choice for young girls. And that’s somewhat accurate, but you should remember our vast ignorance when it comes to both sports, we’re honest enough to admit that, and it’s not quite fair to either sport to make a claim, either way. But – either way – it’s an interesting question. For a young girl watching these just completed Olympics, which has more of a draw? Executing a flawless uneven bars routine and receiving the adulation of thousands in the arena and millions more around the world, basking in the glow of a perfect individual performance, or battling in the dirt for an hour and a half, jumping into a sweaty, messy, muddy, ecstatic pile of arms, legs and torsos, celebrating the almost random flight of a checkered ball that finally found its way to the back of the net? One is more Cinderella, the other is more Cinderella story. But both are things of beauty. And there are, we admit, worse things to aspire to. And for the last time until Sochi: USA (Women)! USA (Women)! USA (Women)!